In most modern firearms its common for the user to be able to pull back on the slide and release to load the first round into the chamber. This is often referred to as "sling shot" action. Frustratingly enough, for the Ruger 22/45 this is not the case. The design of the bolt stop forces the shooter to press on the slide release to load the first round. Unfortunately, in the case the user does not first pull the bolt back this action can result in wear on the bolt stop and bolt face. The "KaneWolf" part kit installs in minutes and allows Ruger 22/45 owners to perform reliable and consistent "sling shot" action. With a specially designed bolt stop that is spring assisted your Ruger 22/45 can function just like any other modern firearm today. All other functions of the pistol are completely unaffected, including the last round hold open. The "KaneWolf" part kit installs in minutes and allows Ruger Mark III 22/45 owners to perform reliable and consistent "sling shot" action. All other functions of the pistol are completely unaffected. Get a "KaneWolf" for your Ruger 22/45 today! 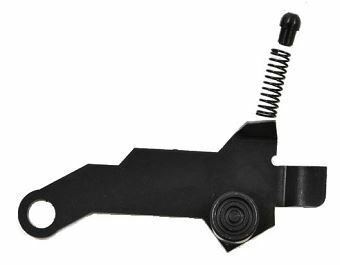 Please note that this part kit is designed to fit all Ruger polymer frame Mark III 22/45 model pistols.